Back in 2004 House Stalwart was born out of a bunch of friends getting together and planning a community for the launch of the newest up and coming MMO… the World of Warcraft. Over those years we’ve had a somewhat bumpy and often storied past, but at the core the guild remained based on a few core tenets and a shared sense of ethics. 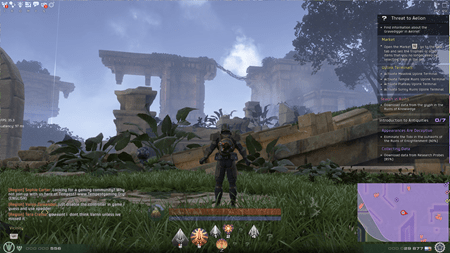 It was a set of values that spanned from game to game, and some of my proudest moments were when one of my random guild members would do something awesome out in the world… and news of it would get back to me. I had built a really awesome thing, and people were happy in it. The problem was that at the time I was not really happy in the game any longer. The yoke of leadership was chafing, and towards the tail end of Wrath of the Lich King, the guild pretty much went on autopilot. 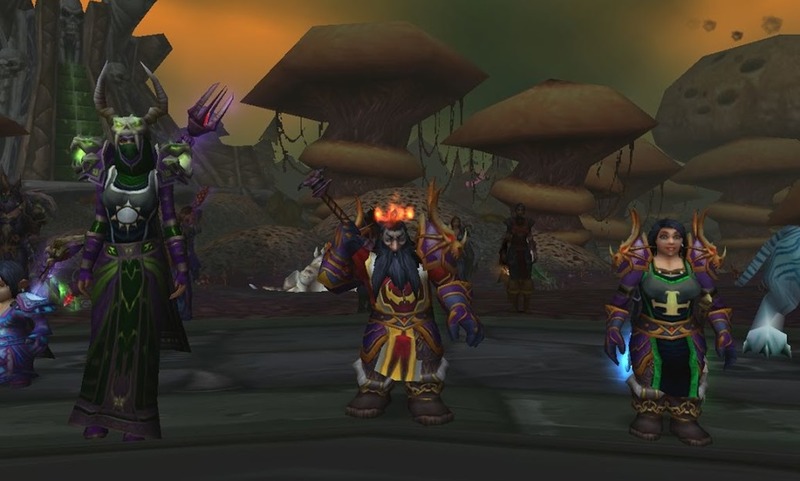 With the release of Cataclysm we went through a lot of major changes, as the shift of focus went away from a non guild based raid, to actually raiding as a guild. 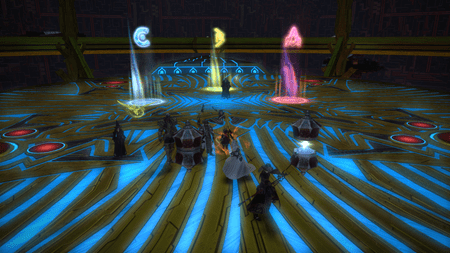 In the process we gobbled up four or five different guilds that had been feeding the Duranub Raiding Company. As a result of this upheaval was a lot of social strife, as various groups that were not entirely used to sharing the same guild had to cohabitate. As this happened I got more distant myself, because I simply was not enjoying the game anymore. When I got into the beta of a game called Rift I grabbed on with both hands, and tried my damnedest to recreate the magic of House Stalwart over there as well. There was a big leaving as folks flaked off to join me in Rift. It didn’t last of course, but it was enough to pull a good number of people away form the WoW guild. When Star Wars the Old Republic released another big chunk of players flaked away, and each time something new came out the cycle would happen again. I had set the events in motion and it had left the guild in a state of chaos. In many ways House Stalwart was somewhat of a failed state when I returned for my brief stint during the launch of Mists of Pandaria. Guild chat was deathly quiet, there was a significant fracture in the guild forming that I talked about the other day, and as a whole the entire place was filled with people that did not know who I was. The number of things I would need to do to fix what was wrong with the guild just felt staggering. I did a few minor adjustments, but for the most part I assumed that since the guild was running itself, that this must be what the players had come to expect. The place no longer felt like home, so after a few months of personally getting bored with WoW again… I left. When I came back recently something had changed, either in me or in the guild itself. I saw a glimmer of the greatness we once had. Additionally I saw a lot of problems that I thought could be fixed. I was reluctant to take back the yoke of leadership, because quite simply I was not sure if I would be around for long. I expected this stint in the game to go much like the last, with me getting tired of it all and going elsewhere. I had daily conversations with Rylacus the steward I had placed over the guild after my return during Pandaria, and almost always they ended up with some discussion of me taking back the leadership. To be truthful when he handed back the highest rank on Monday I was still very reluctant to do so. When Rylacus agreed to take over, it was to keep the lights on and things moving forward. We had an agreement that if any of the heavy lifting needed to be done, or any drama arose that it would be me that dealt with it. Over the year of him at the helm, he did a phenomenal job of maintaining the status quo and keeping the guild moving forward. I would honestly say that the guild itself experienced a bit of a renaissance with his hands off approach, and we are more active now than I have seen in years. However as a guild on autopilot for over two years, there has also been a lot of discord and resentment that had set in. The other night a long time guild member sent me a tell in game and wanted to talk to me, as the founder about the guild policies. He said that he wondered about the recruitment policy, and whether or not we ever looked back and reflected upon whether or not an invite was a good one. I spouted off the well rehearsed lines I have always said, but as I was saying them… I realized that no really we did not any more. Then he hit me with a statement that cut through to my heart like a razor. 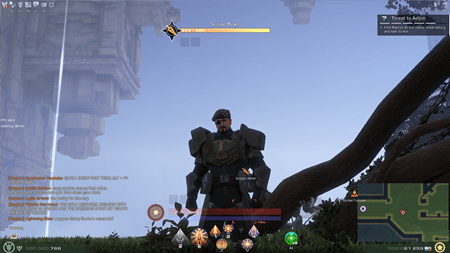 He wanted to talk to me about the “falling guild standards”, and I guess I had realized this was happening but until he came to me and talked to me about it… I was in a bit of a state of denial. Things were in fact far worse than I had let myself believe. In particularly a lot of the recent strife has centered around a recent invite, the nephew of a long time member. Generally what happens in this case is that I bring up the issue with the sponsor, and if they cannot deal with it we remove the person from the guild. I had gotten lax to be honest, and without that guild master tag… I imagined that it is no longer my duty to police the guild. The reason why I took up the tag in the first place all those years ago, is because no one else was going to create the type of guild I wanted to exist in. As I sat there over the weekend, I realized that once again… no one was going to step in to fix the wrongs in the guild if I did not step up and do it myself. After much soul searching, I accepted the guild leadership of House Stalwart in World of Warcraft on Monday night. I had originally intended to ease my reforms into the guild, but last night things reached a crescendo ending with the quitting of a long time member. I managed to talk the member back from the brink and they rejoined… but as a result my first act was to lock down a few of the functions in the guild at least temporarily, and to remove the most negative of the influences from the guild. Over the coming weeks I will be identifying every single one of our 869 current members. I want to know who they are, where they came from, who they are connected to… and most importantly if they are a positive influence in the guild. I had already been working hard with mixed results on trying to bridge the gap between the haves and have-nots, but I feel like there is a lot more work to be done on that front. I am trying to exist in both worlds and get the two sides talking and interacting regularly… and in some ways this is working, but in others… there is still a lot of resentment to work through. When I kicked the questionable member from the guild last night, I had a chorus of private messages thanking me. Many of the members simply thought that no one cared about that sort of thing anymore. No one had been complaining about anything to myself or Rylacus until that one brave member stood up and said “this is a problem” and shook me back to reality. My ultimate hope is that we can turn the tide and bring back House Stalwart to its glory days. The chapters in the various other games that I have founded have clung tightly to the original tenets, but the original guild strayed from the path. My biggest hope is that in writing this, and reaching out to the members… is that they now know that I do care, and I do want things to be better. I want players to interact and communicate regularly filling my screen with happy green spam. I think last night I took the first steps along a long path that will usher several positive changes. I hope that folks now realize that my door is always open, and if they have any issue… be it game related or otherwise that they can talk to me at any time. We used to jokingly call ourselves the “Little Guild that Could”, and over the years that “Little” part changed drastically, but I feel that spirit remained in place. It felt like as a whole we were pulling towards some shared goal. This is the magic that I want to revitalize in the guild, the fact that we are not just a tag to wear over our heads but instead a large extended family. This tapestry is woven out of so many different personalities and play styles… but together we have always been something more. I am back, because I love these people and I have missed them. I want to be the leader I used to be, the leader they deserve. I played WoW for over 7 years without fail… and after two years of wandering around nomadic… I have simply gotten tired of all the jumping. I feel like I have come home, but there is going to be a lot of work to return the guild to the home I want it to be for us all. If I remember correctly the last time I wrote a real post before my Nano recess, I was talking about the upwelling of nostalgia brought on by playing Hearthstone. I fought valiantly to resist but before long I was staring at the account section of the battle.net page and renewing my subscription. I had put this off because really I assumed this decision would end in tears. The odd thing is so far it has not. I have been enjoying the hell out of playing, and have even resumed raiding a bit. I don’t want to jinx it by saying I am back, but so far it feels like at least a possibility. One of the awesome things about coming back at the tail end of the expansion is that Blizzard tends to give players many different ways to catch up gear wise. I have spent a ton of time out on the Timeless Isle and have been collecting sets of level 90 heirloom gear for each of my alts I intend to level. 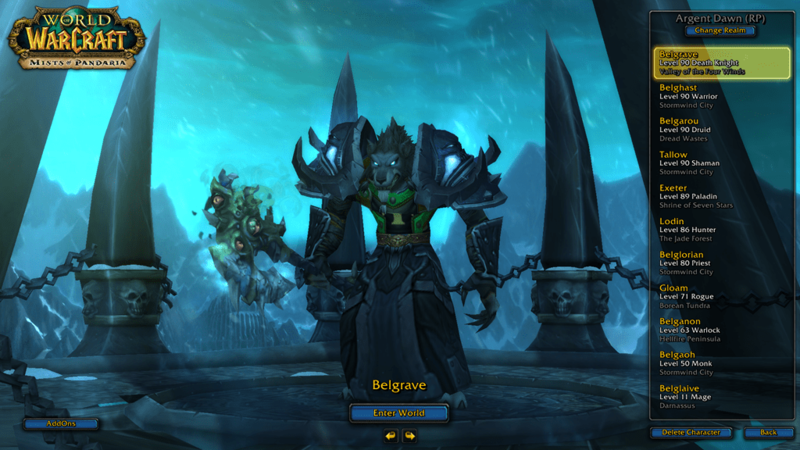 Since coming back I have caught my Deathknight Main Belgrave and Druid Belgarou up a bit in gear, leveled my Shaman Tallow and Warrior Belghast to 90, and am within a stones throw of 90 on my paladin Exeter. There is part of me that wants to push as many toons to 90 as I can before the release of Warlords of Draenor. I have to say despite all of the negativity flowing around it, I am really looking forward to the expansion. They said during Blizzcon that the majority of the content would work more like Timeless Isle, and that was pretty much music to my ears. I love the way the content on the isle works, and I can spend hours both there and on the Isle of Giants tearing about the mobs with Belgrave. I think my happy medium is a mix of quests to give me purpose, and then found objectives along the way to force me to stop and smell the roses. If they can strike a balance, I think the content will be just about perfect for me. Not to mention that Garrisons sound amazingly fun, like a mix between player housing and the crew skill system in SWTOR. At the beginning of Cataclysm I got a serious case of wanderlust. I would like to think it was because Rift was so amazing, but in reality I think I just needed a break from WoW. At that point I had played it for almost eight years straight without significant pause. But the sad thing is, that while I played it for seven years, I have yet to play a single game since for more than seven months. When I wandered off so did a lot of other guild members who were feeling a similar drag on their time. The untold story however is the fact that the vast majority of the guild stayed in World of Warcraft and in spite of my recruitment to other ventures… seemingly thrived. In fact I would say that right now Stalwart WoW was experiencing a bit of a renaissance with folks coming back that have long been dormant. You can say this is the “Blizzcon Bump” but it seems a bit different for some reason. On my server Argent Dawn, I am seeing people showing up on my friends list that had disappeared years before I left the game. Even seeing familiar names popping into channels that out of nostalgia I am still joining. As much as I wanted to deny the fact, World of Warcraft is still thriving at least in pockets of players that have kept the embers of the community burning brightly. In my absence Rylacus has done a phenomenal job of “not messing with things” as he puts it. He has always been one of my closest and most loyal friends, and as I have been gone he has simply tried to continue on with what he thought I would do. It seems to have worked, because on week nights we tend to have 20-30 or more people online and active in doing something. The only problem is that this maintaining the status quo has only caused to further some divides that started back in Cataclysm. When I said “A Guild Divided” in the section heading, I was not referring to the nomad gamers and the wow loyalists… but instead a rift that was always there but has deepened in my time away. Essentially our guild right now is a tale of two raids, the haves and the have-nots essentially. 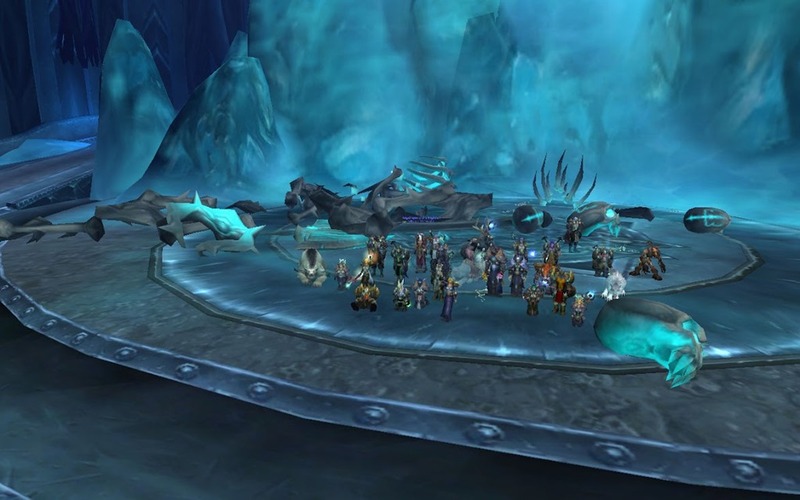 One raid has thrived clearing content and racking up the loot, while the other has floundered struggling to fill. There has been no intended malice, but the lesser performing raid has lost a lot of its brighter members to the better performing raid as folks sought out the path of easier loot. As a result there is more than a bit of bitterness and bad blood that has developed towards the alpha team. In the past I had served as a bridge between the two worlds, a bit of a buffer to lower the frustrations and aggressions. Rylacus has tried hard to fill these shoes but he simply does not have the volume of playtime that I do. Now that I am back at least for a bit I am trying my best to bridge this rift and hopefully mend the way between. As a result I have started tanking for the lesser progressed raid, and it seems like I am the difference between failure and success. The first week we downed new content, and it seemed so easy that I had no idea it wasn’t already on farm. The other tank is amazing to work with, and I am adjusting rapidly to this whole new concept for me of “no main tank”. Additionally I am trying to attend the events sponsored by the alpha team to build the social equity there. 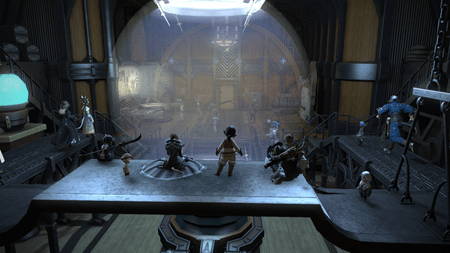 The “big kids” have been gracious enough to host an open flex raid night on Mondays and this is getting betters of both teams in the same space. It is a bit awkward at times, but so far I think it has been an overall positive experience. The flex gear will help bolster both raids. The holidays have taken a big chunk out of our schedules, but I am hoping this week we can return to normality. In a sort of serendipity… several of my blogger and twitter friends have characters on Argent Dawn or are rerolling there. Going to try and get as many of them as I can into the open raid nights. When I had come back for Pandaria the guild felt wrong to me. No one talked, no one worked together… and I really did not know how to fix it. Now coming back things are just different. Guild chat is full of lively conversation. Folks seem happy, and willing to help one another. Stalwart had survived all these years on a shared spirit, a feeling that we were all working together towards a greater good. During Cataclysm it feels that this spirit lost its way as we absorbed so many of the smaller satellite guilds that made up our non-guild-based raiding alliance. It feels though that in the midst of all of this a strong community has evolved. Here is hoping that I can be a catalyst towards solidifying this community into something truly great. If nothing else, I have been remembered and I still very much feel loved by my WoW family.